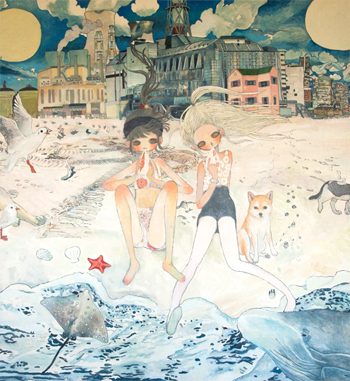 From Thursday March 6, Kaikai Kiki Gallery is pleased to present a solo exhibition by Aya Takano. as well as several other works which showcase the maturation of her practice since here debut nearly 20 years ago. Makoto Azuma, which functions as a meditation on the interconnection between humans and plant life. Before 3.11, the natural disasters that devastated Japan on March 11, 2011, I had always felt certain that some incredibly wonderful world existed somewhere else, somewhere other than here and now. But now I have come to think that the real paradise is right in front of me, in the fluttering leaves, in the sunlight, and in the wind–not somewhere else. Although I was looking for them elsewhere, just like in Maeterlinck’s The Blue Bird, perhaps I was creating my own paradise and hell right here in this place all along. 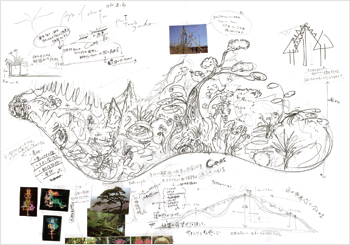 For this exhibition, Takano has collaborated with botanical artist Makoto Azuma to create a 7-meter-long forest within the gallery. The yellow handkerchiefs found in the forest were inspired by Takano’s visit to the devastated town of Arahama, Sendai after the natural disasters. 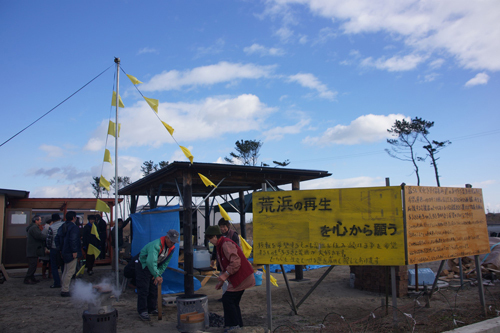 What Takano saw was a project called “Yellow Handkerchiefs of Hope,” organized by the residents and supporters of Arahama in the hope of reviving their hometown. Moved by the yellow handkerchiefs fluttering against the blue sky, she has incorporated them in this work with the cooperations from the local residents of Arahama and with her sincere hope to support their efforts. Born in 1976. Flower artist. Azuma opened his first flower shop in 2002 and currently owns JARDINS des FLEURS, an haute couture florist in Minamiaoyama, Tokyo. Since 2005, Azuma has expanded his activity as a flower artist internationally to New York, Paris, and cities in Germany, among others. In 2009 he founded Azuma Makoto Kaju Kenkyusho (AMKK), an experimental botanical group that explores various potentials of plants. Focused on plants, the group is active in a wide range of fields. Azuma identifies the most mysterious forms peculiar to flowers and plants and heightens their values by converting such forms into singular aesthetic expressions. joseph nothing started his career as a mixer in 1988 when he participated in Consummation, an album by Ground Zero, a group led by Yoshihide Otomo (the composer of the TV drama, Ama-chan fame), as Rom=Pari. Since 2001, he has released two albums, a single, and two compilation albums from Planet-μ records, led by μ-ziq, who handles remixes of Bjork and Aphex Twin. Starting in 2007, he has released a trilogy of albums produced at an abandoned hospital with full artistic collaboration with Aya Takano, Shambhala number on, two, and three from UMAA records. He handles a large number of music projects internationally as a remixer, commercial music composer, and an arranger. Born in 1956 in Yokohama. Since 1996, Bando has won the Encouragement Prizes at the Japanese Classical Dance Association’s Spring Dance Festivals for her performances of “Tomoyakko” and “Tamaya” and the Festival Prizes for “Genta,” “Toshima,” and “Ryusei.” In 2001, for “Ryusei,” she concurrently won the special encouragement award from the Minister of Education, Culture, Sports, Science and Technology. She performs in a variety of productions including “Honmono no Butaigeijutsu Taiken Jigyo” show organized by the Agency for Cultural Affairs, “Gei no Shinzui” show organized by NHK, and self-produced performances at the National Theater. While classical dance is her lifework, she also choreographs creative dance pieces. In 2013, she unveiled a piece that combined a recitation of Kenji Miyazawa’s “Ichou no Mi” and dance. She teaches at her studio in Yokohama and performs both classical and creative pieces. Shima no Senzai is the name of a shirabyoshi who lived during the Heian Period (794 – 1185). Shirabyoshi is a music-and-dance form that emerged toward the end of the Heian Period and also refers to the professional female performers of the form. Nagauta “Shima no Senzai” is a piece that depicts the way in which Shima no Senzai, a shirabyoshi recorded in Heike narratives, dances elegantly and resolutely. On this occasion, I will perform the second half of the piece, in which the shirabyoshi dances under the moonlight, embodying the flow of water and playing with the water. Water is the source of life; I would like to dedicate this dance to the blessing of the ever-abundant, sacred water. Born in 1944 in Yokohama, Fujimatsu began his study under Shinnai Katsue in 1969.
in 1989, he revived the Shinnai Nagashi (a street performance of Shinnai style music) in the restaurant district of Noge, Yokohama. In 1990, he established Shinnai Bushi Sagami School with the backing of Fujimatsu Nagatodayu, the Chairman of Shinnai Association, and adopted the professional name of Fujimatsu Enjidayu. His recent activities include his 40th year professional anniversary performance in 2005, the 20th year anniversary performance of the Sagami School in 2008, and his participation in the 64th Agency of Cultural Affairs Art Festival in 2009. Born in 1952. Cultural anthropologist and environmental activist. Professor in the Faculty of International Studies, Meiji Gakuin University. Facilitator of the NGO, Namakemono Club. Co-representative of the NPO, Café dela Terra. With concepts such as “slow life,” “Gross National Happiness,” and “candle night” as his keywords, Tsuji has long been advancing the environmental and cultural movements. At the same time, he has been promoting “slow business,” a concept of business that can harmoniously coexist with the environment. Publications include Slow is Beautiful (Heibonsha Library) and Namakemono Kyoju no Burabura Jinruigaku (SOKEI Public). Born on September 9, 1968, in Hirosaki, Aomori. After graduating from College of Natural Sciences, University of Tsukuba, he joined Gakushu Kenkyusha (Gakken) in 1991. After working in the editorial department of the magazine Rekishi Gunzo, he transferred to the editorial department of the magazine Mu within the first year. In 2005, he became the 5th Editor in Chief of the magazine. Born in 1974 in Sapporo. Poet, writer, vocalist, and a fortuneteller. Publications include a poetry collection Tanporuporu (Tanka Kenkyu Kai), story collections Tarachine Dream Mine (PARCO Publishing) and Virgin Pancake Kokubunji (Hayakawa Shobo), and a picture book Sanbiki no Koneko (Fukuinkan Shoten Publishers). She is the vocalist for the band Thrilling Thirty and reads fortunes under the pseudonym Je t’aime ★ Mammy.